Experience Jedi Training… it’s free! Do you have a young Padawan in your family from the ages of 4-12? If so, make sure you take a trip to Hollywood Studios during your trip to Walt Disney World (or Disneyland Park in California)! 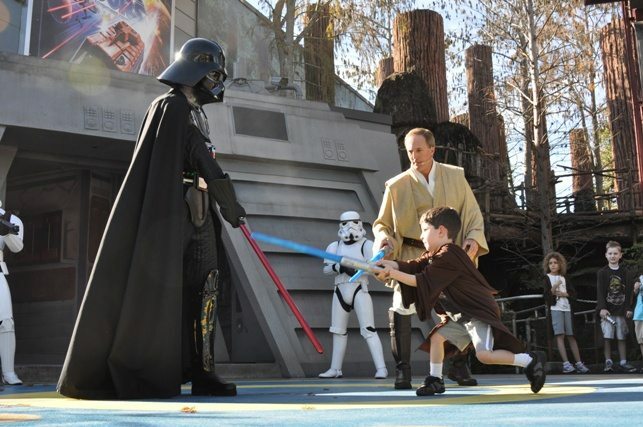 Jedi Training is a not to miss attraction for any Star Wars fan. On our most recent trip, my 9 year old daughter and 6 year old son both participated, and they both had a blast! What’s Jedi Training All About? Jedi Training is basically a stage show with groups of 10 young Padawans at a time participating and being trained by a Jedi Master. At the end, Darth Vader makes an appearance, and each child gets to face off against him individually. Due to the limited number of slots available each day, planning for Jedi Training is an important part of any touring strategy at Hollywood Studios. If you have a child interested in participating, be sure to get to the park 20-30 minutes before park opening (earlier if it’s a busy time of year). Keep in mind that the participating child(ren) MUST be with you to sign up. Once you enter the park, head to the left. Sign ups are generally in the Sounds Dangerous building, but there are sometimes variations. There will be cast members with signs pointing the way, so be on the lookout for them to find your way. Once you get there, get in line to sign up. 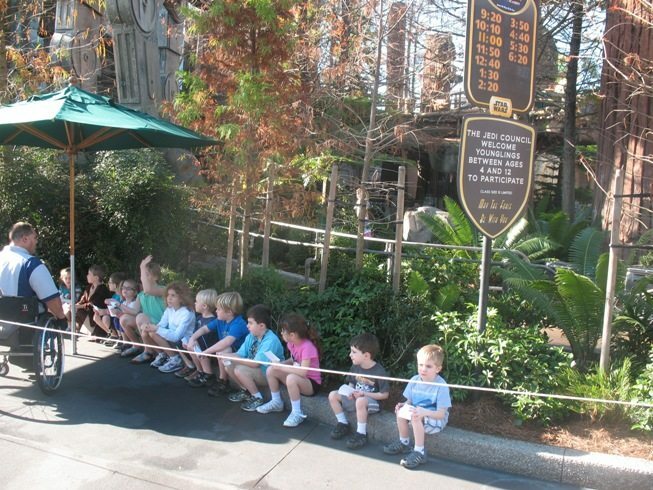 When you get to the front of the line, the cast member will ask your child some basic questions and tell you your show time. 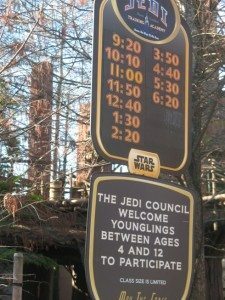 It’s a good idea to know your fast pass return times to be sure your plans don’t conflict. You will receive a slip of paper with the time of your show and what time and where to report back. How Does the Jedi Training Show Actually Work? First, be sure to be back at the time indicated on your slip or you risk having your child’s slot given to someone else. They will gather all the children together and spend a little time talking to them and playing Star Wars trivia games. Then the children will be walked over to the stage (right next to the Star Tours entrance). Each child is given a robe and a light saber (which they will return at the end of the show), and they will line up along the side to wait for the show to start. When it’s time for the show to start, the children will be brought up onto the stage, and they will each select one of the spots marked on the floor. The Jedi Master will then begin the show, leading the children through a routine of movements with their light saber. The Jedi Master definitely has fun with this. Since there is a wide range of kids participating, some of the older kids will catch on right away, while the younger ones sometimes have trouble even getting the light saber to open! He handles all of this, and makes for an entertaining show. The routine is specific to match up with the soon to come battle with Darth Vader. Once the training is over, get ready for the fun! The ominous music will signal the appearance of Darth Vader (along with a couple of somewhat bumbling storm troopers with him). One word of caution – on an earlier trip when my son was too young to participate, we decided to just watch the show. He enjoyed it until Darth Vader came out. At that point, it became too loud and scary for him, and we needed to leave. Each child will get the chance to face off against Darth Vader, going through the motions learned during training to help defeat him. Once everyone has had their turn, Darth Vader will leave, and each child will get a certificate to take home with them. What Else Should I Know About Jedi Training? If you are planning to have your children participate in Jedi Training, I highly recommend pre-ordering Memory Maker. There is a PhotoPass photographer at each show, and the pictures taken are amazing. They take tons of close up pictures of each child as well as group shots. After the show, you can go to a PhotoPass location, and they will put all the pictures from your show on a screen. You can then go through and indicate which ones have your child in them. That way you will only get your pictures on the CD instead of all the pictures from the show. Jedi Training is one of the truly unique experiences at Disney, and with no extra charge to participate, it’s not to miss for any Star Wars fan! Jen Zinno is the Owner and a Disney Vacation Planning Specialist with Mickey Adventures. Jen loves all things Disney and would love to help you plan your dream vacation! Previous PostPin Trading Tips for Children Next PostDisney Celebration Buttons, A Fun Freebie! I just couldn’t depart your site before suggesting that I extremely loved the usual information an individual supply for your visitors?